So We’ve all had several days to let the fact sink in that System Shock 2 is again legally purchasable. If you’re in the first batch of people that got a copy you might by now be finished with your first play-through. OK Fine the graphics look dated and the ending left things wide open for More but for legal reasons I doubt there will be a System Shock 3 and for storytelling reasons I hope not. Keep in mind Night Dive only has, if my armchair legalese is correct (I am Not a Lawyer) they only have the right to distribute and Star Insurance still retains the rights it had gotten from looking glass. Whether or not EA factors into any of this or not remains to be seen, but for now it is probably best to consider the franchise not going ino sequels. After all there’s only so many times a villain can show up and still feel like a credible threat. Well for starters you can add graphical mods to breath a little fresh life in. There is no one unified ‘apply this and everything changes’ mod as such, mostly because while the older members of the System Shock community can agree that the Shock Texture Upgrade Project is well worth completing (and it is all but finished) due to how the game had worked up until the NewDark patch (which is included in the GoG release, so no worries friend you’re safe) things like replacing floor textures or monitors have been reliant on more extensive measures. However while in the past it’s been a headache things are now to the point where one can practically drop mods in the DataPermMods folder and roll with it. Granted that’s with several mods applied (Rebirth, Tactacool’s Wrench, Shock Texture Upgrade project, and possibly even 400. Thankfully all can be found at System Shock’s Community Mod Site. However due to the nature of older mod managers it takes some slight doing to make everything work properly, especially in instances where you go beyond doing a facelift to the game and want to, Like with SecMod or Straylight’s Anomalies, Discrepancies and outright Bugs Mod change gameplay (or in ADaoB patch gameplay quirks) not all mods are compatible with eachother. Fortunately User Kolya and others are working on better options so you aren’t in constant fear that if you want to revert from a modded state, or possibly switch mods, that you might fry your game install and have to start from scratch. To all those that might be worried at whether or not all this is compatible with your fresh GoG installation, or that the older retail CD version might be left out in the cold with all this work? Don’t worry, even though the GoG version uses an older patch tool steps have already been taken to ensure that SS2Tool (the preferred patching utility, at version 5.0 as of the time of this writing) will work with both versions of the game. Christine’s Quartet: Actually my first and main mission(s) of discussion are actually four well crafted fan-missions that tell a story arch starting with a grunt joining the UNN and ending with him getting bored out of his mind from an enforced vaccation after a long series of… well… going through Hell. Overall I have to say Christine does a wonderful job, in fact personal opinion is she’s better than the actual game designers, in making a believable world through architecture. One example of this are the Quantum Bio-Reconstruction booths (the Cheat Death and Give Him the Middle Finger booth.) Generally speaking each is set somewhere that feels like the ship/station/etc designers realized how important a Death Cheat Respawn Booth would be so give it it’s own little room you stumble out into and usually a medical bed nearby to heal with (if you have a key to attach to it.) Hallways have a feel like if you cleaned up the mess and got rid of the mutants they were lain out like you would for good traffic flow, places to sit in alcoves, decently placed restrooms. There’s even custom models for cabinetry and other knick-knacks like pencils and binders, books. OK fine i know it’s all sounding silly but it’s the little touches that make a place feel alive and Christine, with the help of several modelers and lots of other fan assistance, knocked it out of the park. To cap it all off, especially for Ponterbee Station since it’s the first in the series, Christine went to the trouble of making earth.mis files so you’ll be able to (in theory) enjoy these with your friends. in co-op. This ‘earth’ you’re dumped into isn’t just a tram station and a tutorial building. No my friends there’s traffic, civilians, shops (sadly none of them sell weapons. Oh well,) nd while little of it is important from a game-play perspective it adds to the sense there is a world beyond the space horrors you have to face. While there isn’t a System Shock 3, and I hope there never will be, this is probably as close as we’ll ever get. RttUNN: Christine wasn’t the first Fan Mission author. I’m not even sure if this guy was either, but it’s the first fan mission I can recall playing. Starts you off in a very Half-Life sort of way with you heading into work normal day normal Whatever and then all hell breaks loose. While this one also has outstanding visuals and some awesome moments (the corridor of cyborg ninjas. If you’ve played it you know what I’m talking about. *shudder*) it is far shorter than Ponterbee even in it’s earliest incarnations and to be fair it is still quite enjoyable and the environments are varied. 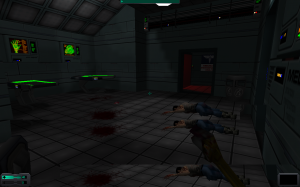 If it were made a year or so later after the community started getting fixes for ShockEd (the level and resource editor for System Shock 2, Thief, and other Dark Engine games) it probably would rank up there with Christine’s mission sets. Play it, it is hard, you’re dropped into a zombie filled mall at the start and it really doesn’t let up on any difficulty. Thanks for scaring the ever loving crap out of us Baydess99. Zygo’s Arena: This is very un-shock-like. It is, thankfully also very very multi-player friendly in that while there is some hacking and exploring to be done it is really just a case of frag the living daylights out of Everything. It doesn’t open you up with Everything though. 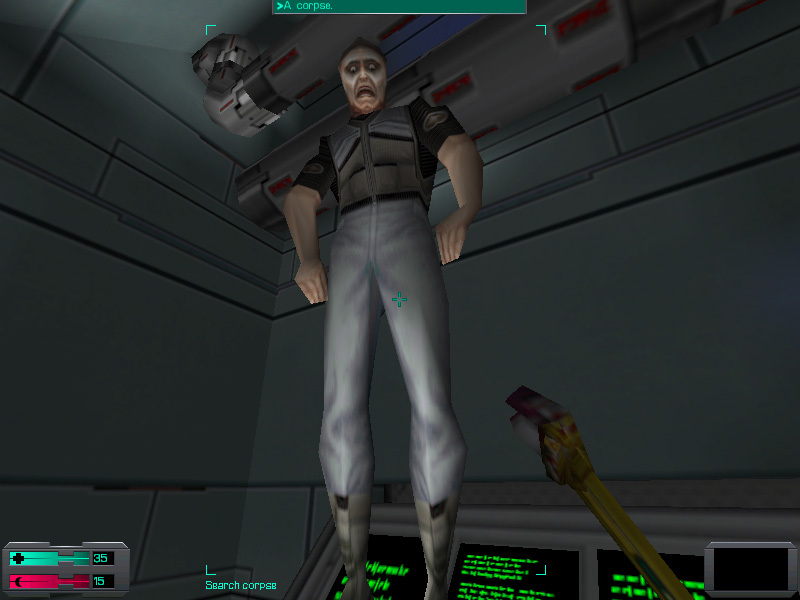 There’s something of a story that uses bits of audio from both system shock 1 and 2 but really it’s just atmospheric stuff for the most part. Item drops are random, CyberModules are pretty easy to come by and while there is no map in the beginning it’s one of the things that unlocks as you progress. Hard? Yes. Lot of fun? Also yes. Sure it ditches the creepy atmosphere for the most part in favor of murder everything fragging, but that doesn’t make it bad. It’s a fun change of pace. It took this guy Years to build, probably mostly because of the scripting and relevant testing ot make sure it works, but for anyone that wants something a little different, or something easy ot drop into with a friend or three this is what I recommend. Zygo, hats off to you man. There are other fan missions but these there (OK technically six) are what I’ve singled out as Must Get material. I don’t intend this as a slight to any of the other fan offerings (one of these being Christine making an interesting exploration level using textures and assets from Thief and it’s a quality work so i”m not excluding due to poor quality.) It’s just these are what I consider Must Play gems, especially if you’ve already beat the main game and want something else to do with your ten dollar investment. 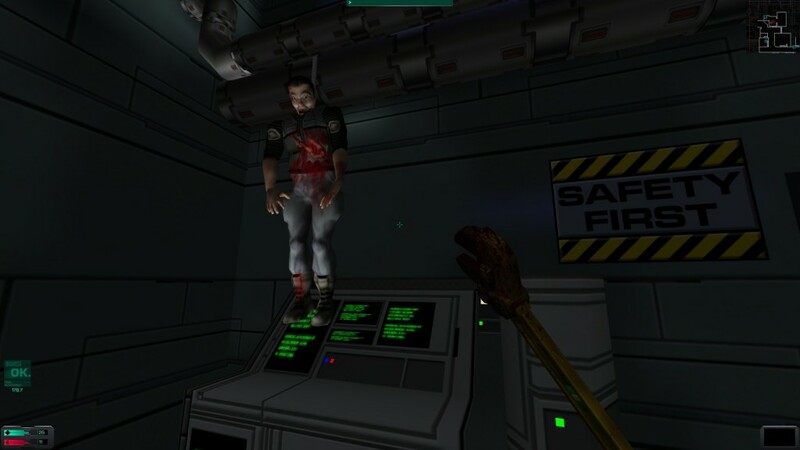 For thirteen years the System Shock 2 Fan Community has been relatively Small and no thanks to how buggy ShockEd has been up until recently only those really dedicated could make it do anything really interesting and noteworthy. Now though with NewDark giving several stability fixes and limitations removals to the editor and GoG providing lots of fresh blood. if we can avoid the community splintering and fragmenting over petty arguments things are bound to only get better. Everything discussed in this article can be found at SystemShock.org. —System Shock End-credits Haiku by Bart, presumingly the Looking Glass Studios employee.